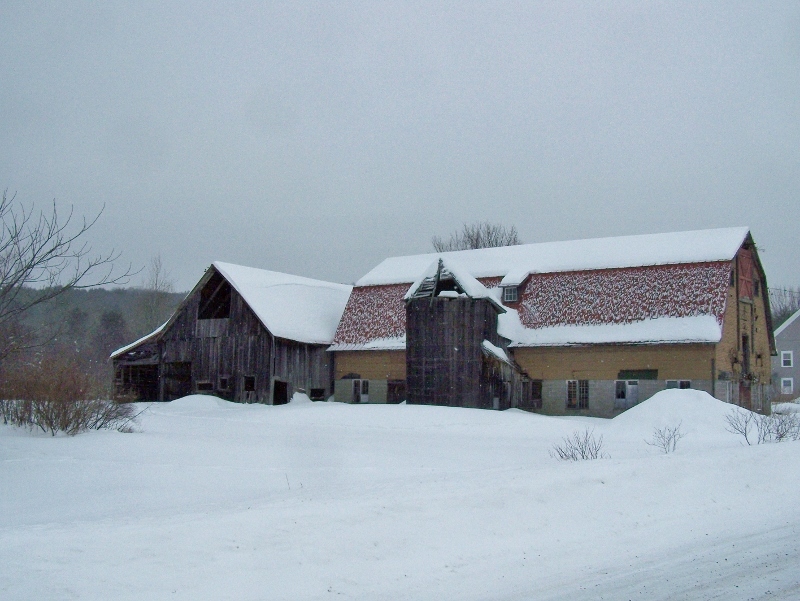 It was a frigid Vermont winter day when we first visited this old barn back in February of 2015. It was too cold, even for us seasoned Vermonters. With more than two feet of snow on the ground, I wished I had brought my snow shoes. 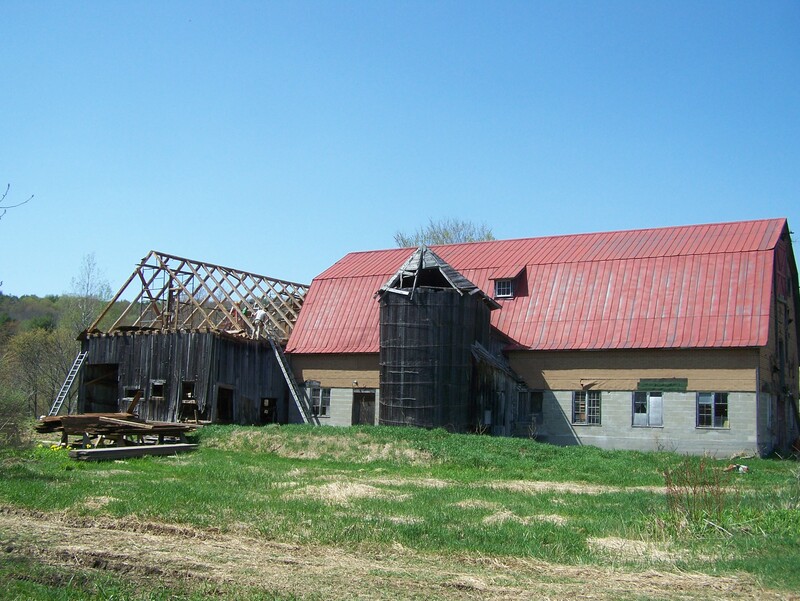 Here’s a glimpse of how the barn looked – on the left – when we first met. The owner had called us to ask if we could dismantle this aging barn and restore it as a new Great Room, attached to their home. The barn, built originally in the 1850s, was indeed a perfect match for the house, a two story country home also built in the 1850s. 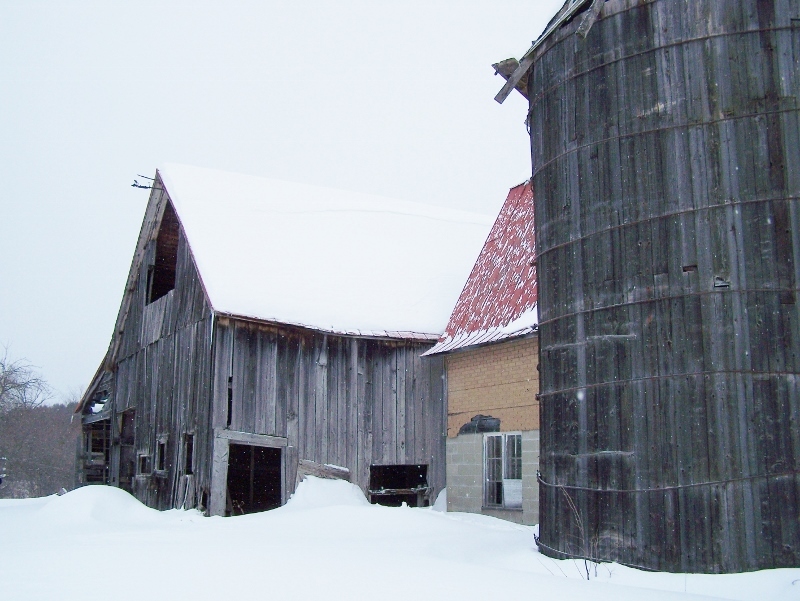 Original barn beside 1940s barn with wooden silo. House is in the back ground, on the right. Judging from the 43 foot hand hewn beams, I concluded that the barn must have been built in the middle of the 19th century. Tall trees were still being hewn by hand into long square timbers. Shorter timbers, such as posts, were sawn at a local mill. During that time, sawmills could accurately saw up to 20 feet of timber, so the hand hewing guys were called in for the longer timbers. I often wonder if those guys – the “old school” timber framers – must have felt like horses when automobiles started to become more prevalent. 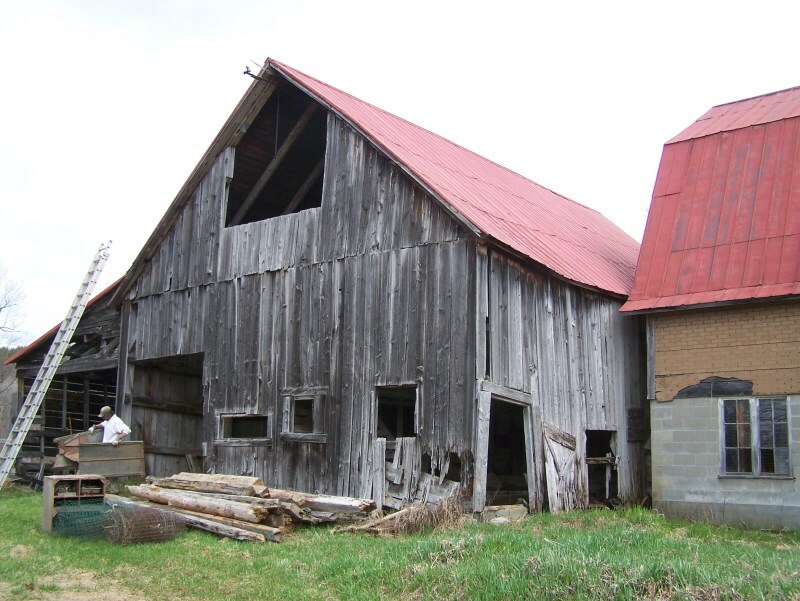 Once the snow melted, we traveled to Cavendish, Vermont to begin the careful process of dismantling the barn. The barn looked far more inviting during spring. 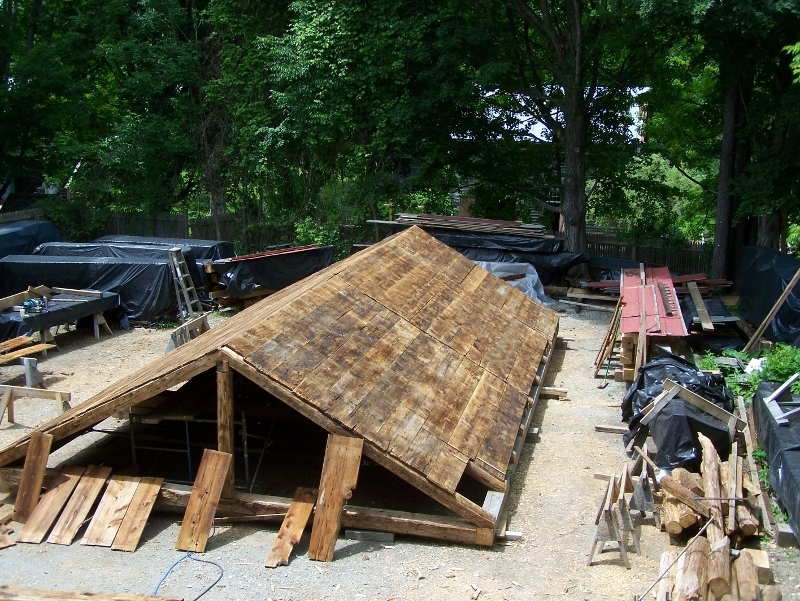 In three weeks, a team of six men dismantled the 30 x 43 foot barn and shipped it to the Green Mountain Timber Frames shop in Middletown Springs. Barn being dismantled, starting from the top. Once at the shop, we carefully washed all the timbers. We then laid them out in their new configuration of 21 x 35 feet and did a lot of joinery work. Next we assembled the roof structure, de-nailed the roof boards, gave them a solid washing, made them straight again, and finally re-applied them to the roof rafters. We made sure everything was well labeled, and then shipped the restored frame back to the Cavendish house site. 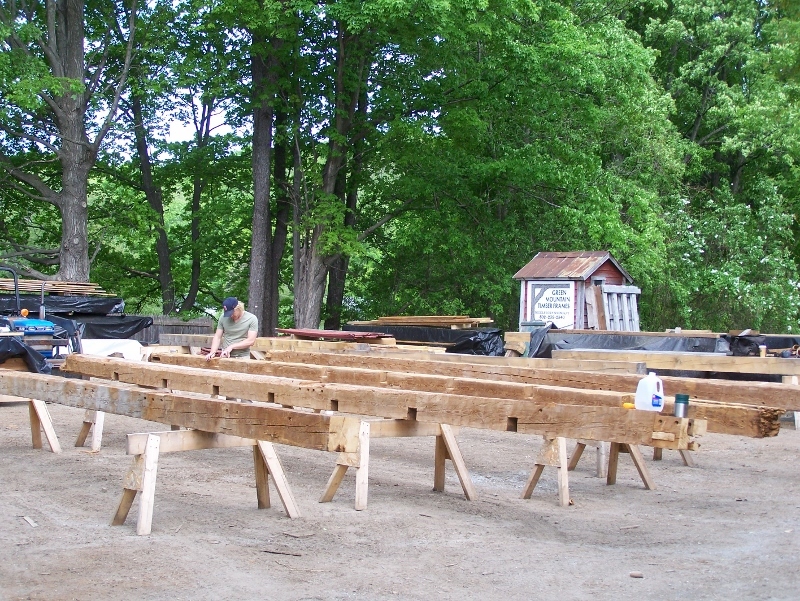 Laying out the restored hand hewn beams into the new design. 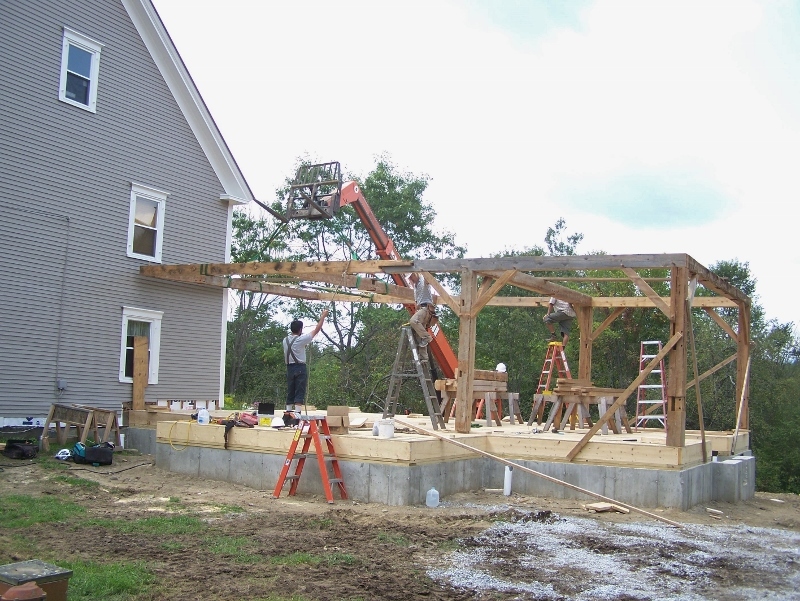 Because we had done the restoration work at our shop, re-erecting the frame for the new Great Room was a pretty straightforward task that took only two days. In weather that was a far cry from the snowdrifts of February, we reassembled the frame under hot August sun with a team of four men and a mighty Lull (lift machine). During the first day, we spent about ten hours at the site. By day’s end we had most of the structure up, thanks to the help of the Lull and an experienced crew. 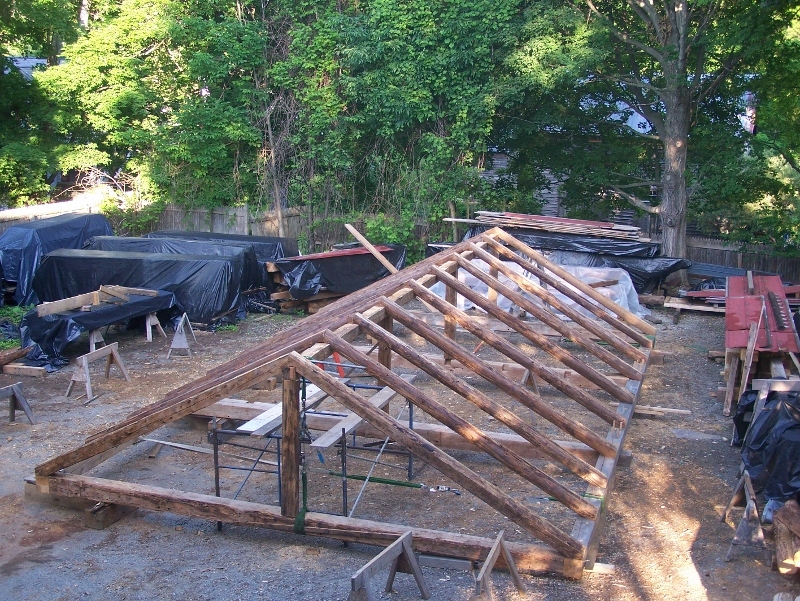 Day two was even more fun as we placed all the roof rafters – always an exciting part of a barn restoration project – and experienced the structure taking its final shape. After hundreds of hours of our labor, the refurbished frame went together like a Lincoln Log set. It’s gratifying each time to watch new life breathed into a formerly very distressed timbered, old barn. Finished frame. The roof is protected by tar paper, ready for the next stage. View from beneath the roof of the restored frame, with our friend the Lull behind. 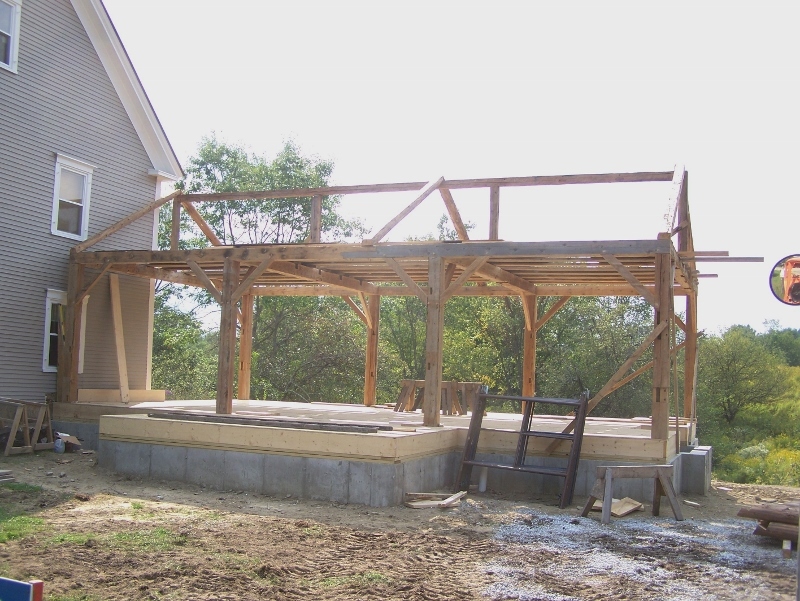 The plans to complete this barn frame include a fireplace, large glass doors, a screened porch and a mudroom entryway. Truly it will become a GREAT room. This was a challenging and rewarding restoration project. 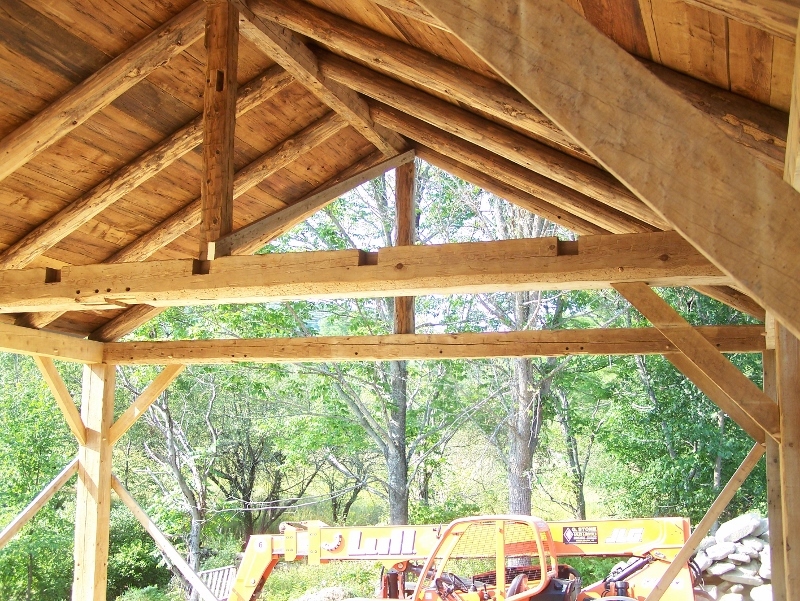 Our next blog will feature a stunning new timber frame boat house, designed and built by Luke Larson and his crew. Stay tuned! 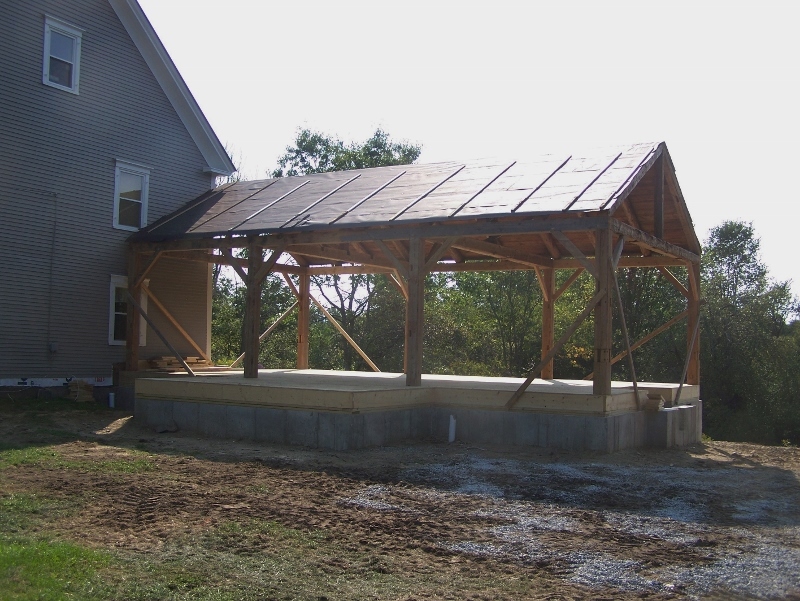 This entry was posted in Barn Raising, Green Mountain Timber Frames, Timber Frame Projects and tagged American heritage, American History, barn restoration, colonial america, Green Mountain Timber Frames, timber frame, timber frame barn, timber frame homes by Green Mountain Timber Frames. Bookmark the permalink.